Background: EnSite Precision AutoMark Module (Abbott) refers to automated lesion creating tool. Only lesions meeting user-defined requirements are placed on the map. The amount of ablation is represented by the size and color of marking spheres. The aim of this study is to present our initial experience with AutoMark Module in AF ablation. Methods: Nine patients with AF underwent electroanatomic mapping and radiofrequency ablation (RF) using AutoMark Module for marking RF lesions. Pulmonary vein isolation was performed in all patients. Cavo tricuspid isthmus ablation was done in 3 patients with atrial flutter. Lesions were marked in different colors depending on force-time integral, absolute impedance drop and RF duration as follows: white (<50 g; <6 Ω; < 5 s); yellow (50-150 g; 6-8 Ω; 5-15 s); orange (150-300 g; 8-10 Ω; 15-30 s); red (>300 g; >10 Ω; >30 s). An auto-mark was created when catheter remained in a stable location for more than 3 s, with a minimum distance between spheres (center-to-center) of 3 mm. Auto-marks were compared with manually placed spheres. 24-hour Holter ECG monitoring was performed regularly until the end of the follow-up. Results: Nine patients (mean age of 53 ± 10 years, 3 male) were included in the study with EHRA class 2b (44%) and class 3 (56%). Auto-marks were placed only when user-defined criteria were reached whereas manual points were marked subjectively. The auto-marks numbered 299 ± 82 per procedure and 5.39 ± 1.42 per RF application. Auto-marks provided good visualization of the ablation lines using the predefined criteria. 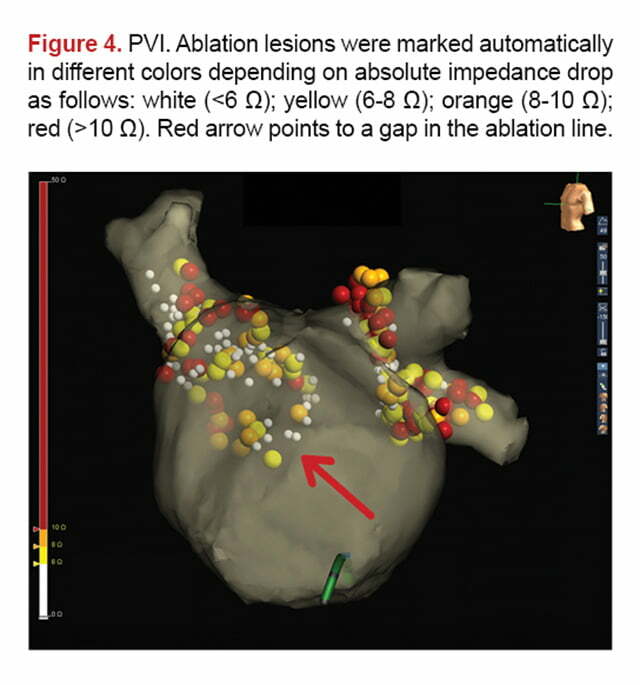 AutoMark Module visualized probable gaps in the ablation line, which appeared as an area without spheres or with white spheres. That was not possible with manual marking because of its subjective nature. Conclusion: AutoMark is better than manual marking in providing real-time visual feedback on lesion creation. Our preselected lesion parameters ensure a tool to visualize possible gaps in the ablation line. Atrial fibrillation (AF) is the most common arrhythmia in clinical practice. (1) The landmark study by Haissaguerre et al. 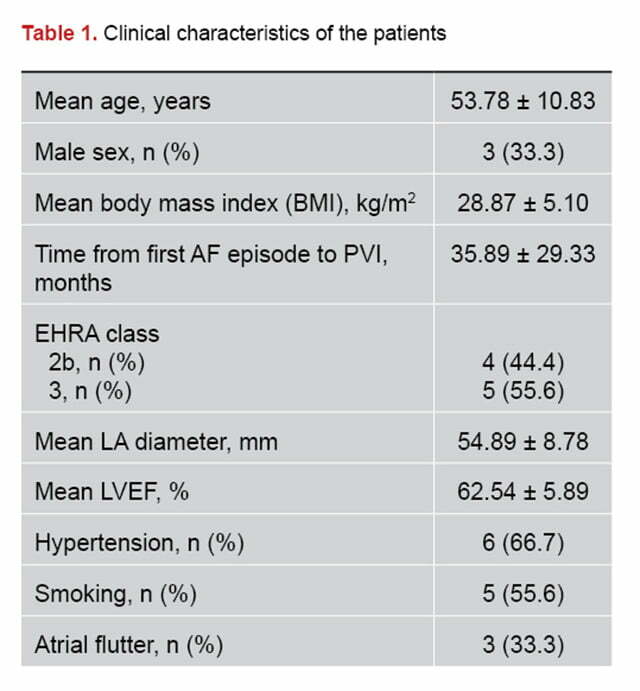 demonstrated that ectopic beats from the pulmonary veins (PV) often triggered AF. (2) This finding focused catheter ablation approaches on PV isolation (PVI). The introduction of electroanatomic guidance technology resulted in a paradigm shift in delivery of therapy for atrial fibrillation. (3-8) EnSite Precision AutoMark Module (Abbott) was introduced in Europe in 2016 and referred to automated lesion creating tool. Only lesions meeting user-defined requirements are placed on the map. 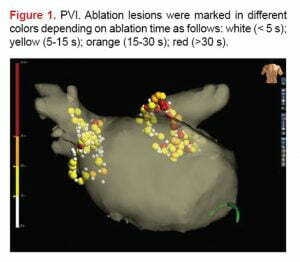 (9) The amount of ablation is represented by the size and color of marking spheres. Miller et al. 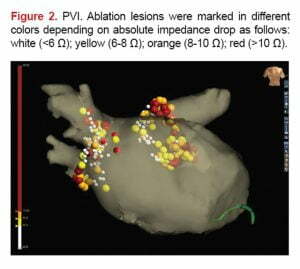 accentuated the role of visual gaps in the ablation line during PVI. (10) According to their study, acute electrical isolation was insufficient endpoint for achieving durable PV isolation. (10) Moreover, pulmonary vein reconnection is considered to be the most important reason for atrial fibrillation recurrence. (11) Hence, it is important to find a way toward durable PVI. Manual marking is the current widespread practice for visualization of ablation lesions. However, it is subjective in nature and we hypothesized that it could not provide real-time visual feedback on possible gaps in the ablation line. The aim of this study is to present our initial experience with AutoMark Module in AF ablation and to compare the ability of automatic and manual marking to visualize gaps in the ablation line. Nine patients with drug-resistant or drug-intolerant symptomatic paroxysmal AF underwent electro anatomical mapping and radiofrequency ablation (RF) using AutoMark Module for marking RF lesions between December 2016 and December 2017 in the National Heart Hospital (Sofia, Bulgaria). Informed, written consent was obtained from all patients. Ablation procedures were performed by 3 operators. Pulmonary vein isolation was done under conscious sedation in all patients. Three patients with atrial flutter underwent cavo tricuspid isthmus ablation. Intravenous heparin (80-100 IU/kg) was administered and continuously infused after femoral access and double transseptal puncture with targeted aPTT>140 s. A decapolar Lasso catheter and an ablation catheter ­(TactiCath Quartz or Cool Flex, Abbott) were introduced in the left atrium (LA). Respiratory gating was performed afterwards, and electro anatomical map of LA, left atrium appendage (LAA) and PV was created. Finally, point-by-point ostial PVI was performed. The EnSite operator marked the ablation lesions manually. The power of RF applications was limited to 25 W for the posterior wall and 35 W for the anterior wall. AutoMark module was started but invisible for the operators. Ablation lesions were automatically marked in different colors depending on absolute impedance drop and RF duration as follows: white (<6 Ω; < 5 s); yellow (6-8 Ω; 5-15 s); orange (8-10 Ω; 15-30 s); red (>10 Ω; >30 s). AutoMark colors were determined by force-time integral (FTI) when TactiCath Quartz catheter was used as follows: white (<50 g); yellow (50-150 g); orange (150-300 g); red (>300 g). An auto-mark was created when catheter remained in a stable location for more than 3 s, with a minimum distance between spheres (center-to-center) of 3 mm. We confirmed entrance and exit block in all PV by pacing from coronary sinus and each PV at the end of the procedure. Procedures were exported and analyzed offline. Auto-marks were compared with manually placed spheres. Anticoagulation and antiarrhythmic drugs were continued until the third month after the procedure. Anticoagulation was continued afterwards according to the CHA2DS2-VASc stroke risk. (12) 24-hour Holter ECG monitoring was performed regularly until the end of the follow-up. Repeat ablation procedure was advised in case of recurrence. Statistical analysis was performed with SPSS Statistics 21 (IBM Corporation, Armonk, NY). Descriptive statistical methods (mean, standard deviation) were used for the definition of continuous variables. Fisher’s exact test was used in the analysis of the associations among categorical variables. P-values of <0.05 were considered as significant. Nine patients (mean age of 53.8 ± 10.8 years, 3 male) were included in the study. Baseline clinical characteristics are indicated in Table 1. All patients had drug-resistant or drug-intolerant symptomatic paroxysmal AF. Each one of the PV was successfully, electrically isolated with entrance and exit block at the end of the procedure. Procedural data are specified in Table 2. Auto-marks appeared only when user-defined criteria were fulfilled. 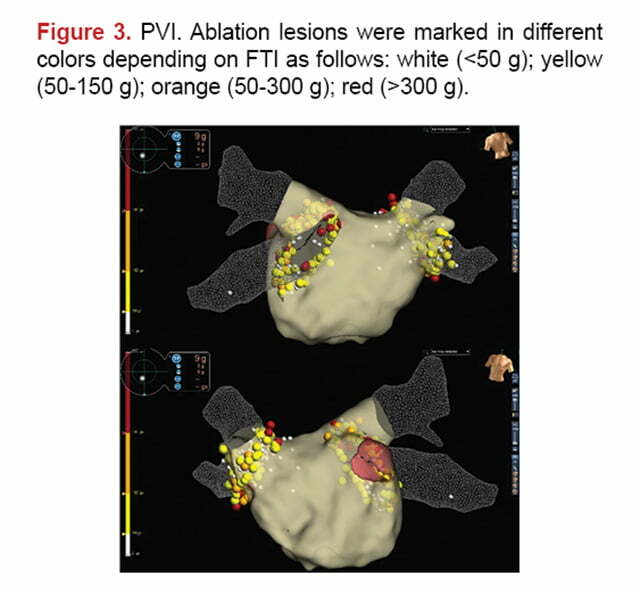 They provided good visualization of the ablation lines (Fig. 1, 2, 3). Furthermore, AutoMark Module visualized probable gaps in the ablation line which appeared as an area without spheres or with white spheres (Fig. 1, 2, 3, 4). That was not possible with manual marking due to its subjective nature (Fig. 5). 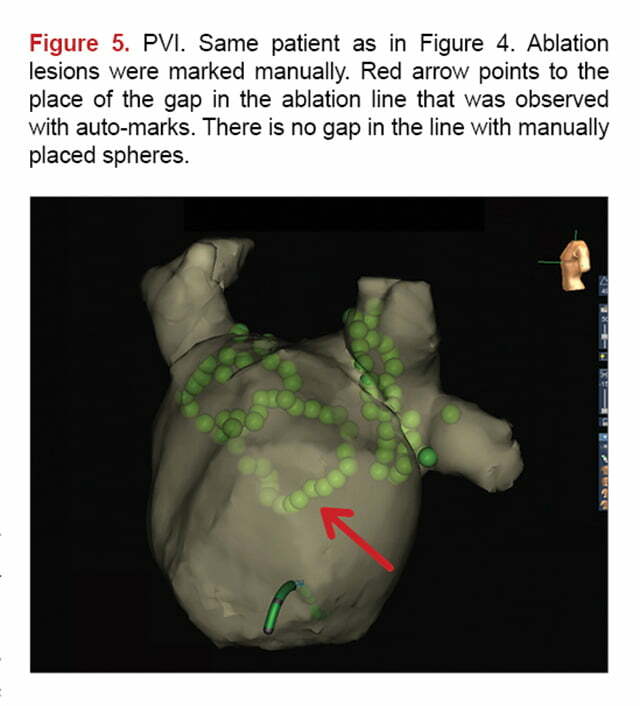 Gaps in the ablation line were observed in 7 patients with AutoMark versus one patient with manual marking (p=0.026). At the end of the follow-up (mean 10 ± 4.7 months), 2 patients (22.2%) continued the antiarrhythmic drugs and 5 patients (55.6%) received an oral anticoagulant. Recurrence of AF, atrial flutter or tachycardia was documented in 2 patients. Consequently, 77.8% of the ­patients demonstrated freedom from atrial tachyarrhythmia. Using the AutoMark Module, we discovered that both patients with recurrences had gaps in the ablation line in more than two PV. On the contrary, gaps in more than two PV were established in only one patient without recurrence (p=0.08). The depth of RF lesions is also dependent on the delivered power and duration of the RF applications . (22,23) However, RF power is relatively constant during ablation. 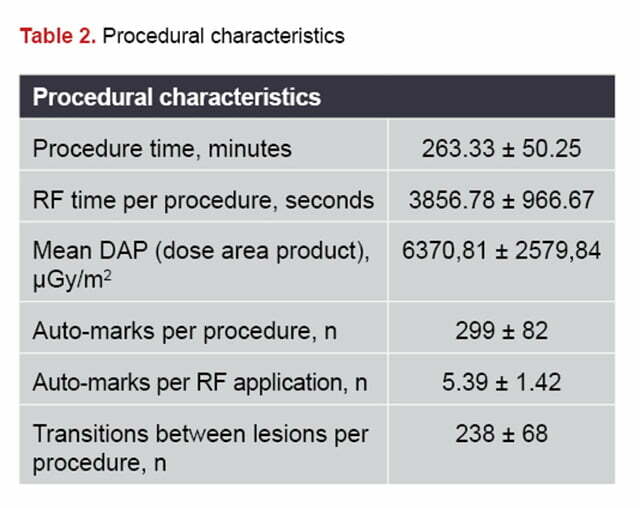 Therefore, we included RF application duration in the predefined model of ablation lesions (Fig 1). Experimental studies prove that impedance decrease is a good correlate for RF lesion volume. (22-26) Impedance decrease, which is less than 10 Ω during point-by-point PVI in humans, is associated with areas of late PV reconnection. (27) Moreover, El Haddad et al. showed that obtaining a minimal impedance decrease of >10 Ω is likely to result in a durable lesion. (17) We have used AutoMark to tag absolute impedance drop with white (<6 Ω), yellow (6-8 Ω), orange (8-10 Ω) and red (>10 Ω) spheres, whereas AutoMark provided good visualization of the ablation lines (Fig.2, 4). Inter-lesion distance was also used as an objective parameter for auto-mark creation in our study. It was defined as center-to-center distance between two neighboring auto-marks. Previous studies demonstrate that inter-lesion distance is predictive for PV reconnection. (17) El Haddad et al. used RF tags which were acquired automatically based on preset criteria of force and stability. (17) They showed that targeting inter-lesion distance of less than 5 mm might be the missing link toward durable PVI. We used inter-lesion distance of 3 mm in our study as a criterion for auto-marks creation in addition to catheter stability. According to previous studies, closing the visual gap is essential for acute durable PVI. (10) We observed visual gaps in the ablation line in 7 patients with auto-marking and the preselected parameters. On the contrary, only one patient demonstrated gap in the ablation line with manual marking (p=0.026). The endpoint of acute electrical isolation of PV can be achieved despite an incomplete circumferential lesion set. (10) However, it can leave potential conduction gaps between PV and LA. (28) Miller et al. determined presence of viable and not fully ablated tissue in the visual gap area. (10) Furthermore, pre-clinical studies revealed that AF propagates through gaps as small as 1.1 mm, and these gaps can be pro-arrhythmic according to several clinical studies. (29-32) Therefore, inter-lesion distance ≥5 mm may explain acute PV reconnection. (33) However, lesions were marked manually in those studies. Our findings show that AutoMark is significantly better than manual marking in visualization of gaps in the ablation line (p=0.026). In this study, we documented recurrence of atrial tachyarrhythmia in 2 patients at the end of the follow-up (mean 10 ± 4.7 months). Both patients had gaps in the ablation line in more than two PV detected by AutoMark, whereas only one patient without recurrence had similar gaps (p=0.08). A study with more patients is needed to verify the statistical significance of that result. There is no single parameter which identifies a durable lesion formation. Therefore, we used a combination of preselected lesion parameters which ensured a tool to visualize possible gaps in the ablation line. However, our study failed to demonstrate that AutoMark gaps in the ablation lines determine AF recurrences. That was an initial study with a small sample size, hence more studies are required to investigate that problem. AutoMark is better than manual marking in providing real-time visual feedback on lesion creation. Moreover, automatic marking establishes gaps in the ablation line more accurately than manual marking. Our preselected lesion parameters ensure a tool to visualize possible gaps in the ablation line. However, further studies are needed to reveal whether there is a benefit from AutoMark on the occurrence of AF recurrences during long-term follow-up. TB participates in a sponsored speaker’s bureau (Boehringer Ingelheim), received educational grants (Abbott, Medtronic, Biotronik) and honoraria and consulting fees (Actavis-Teva, Servier, Merck, Sanofi-Aventis, Berlin-Chemie). Benjamin EJ., Wolf PA., D’Agostino RB., Silbershatz H., Kannel WB., Levy D. Impact of atrial fibrillation on the risk of death: The Framingham Heart Study. Circulation 1998; 98(10):946–52. Haïssaguerre M., Jaïs P., Shah DC., et al. Spontaneous Initiation of Atrial Fibrillation by Ectopic Beats Originating in the Pulmonary Veins. New Engl J Med 1998; 339(10):659–66. Rotter M., Takahashi Y., Sanders P., et al. Reduction of fluoroscopy exposure and procedure duration during ablation of atrial fibrillation using a novel anatomical navigation system. Eur Heart J 2005; 26(14):1415–21. Estner HL., Deisenhofer I., Luik A., et al. Electrical isolation of pulmonary veins in patients with atrial fibrillation: Reduction of fluoroscopy exposure and procedure duration by the use of a non-fluoroscopic navigation system (NavX®). Europace 2006; 8(8):583–7. Pappone C., Oreto G., Lamberti F., et al. Catheter ablation of paroxysmal atrial fibrillation using a 3D mapping system. Circulation 1999; 100(11):1203–8. Shpun S., Gepstein L., Hayam G., Ben-Haim SA. Guidance of radiofrequency endocardial ablation with real-time three-dimensional magnetic navigation system. Circulation 1997; 96(6):2016–21. Gaita F., Guerra PG., Battaglia A., Anselmino M. The dream of near-zero X-rays ablation comes true. Eur Heart J 2016; 37(36):2749–55. Anselmino M., Sillano D., Casolati D., Ferraris F., Gaita F. A new electrophysiology era: Zero fluoroscopy. J of Cardiovascular Med 2013; 14(3):221–7. Zajkac P., Konarski L., Wójcik M. EnSiteTM Precision-3D Cardiac Mapping System. EJMT 2016; 3(12):12. Miller MA., Davila A., Dukkipati SR., et al. Acute electrical isolation is a necessary but insufficient endpoint for achieving durable PV isolation: The importance of closing the visual gap. Europace 2012; 14(5):653–60. Suleiman M., Koestler C., Lerman A., et al. Atorvastatin for prevention of atrial fibrillation recurrence following pulmonary vein isolation: A double-blind, placebo-controlled, randomized trial. 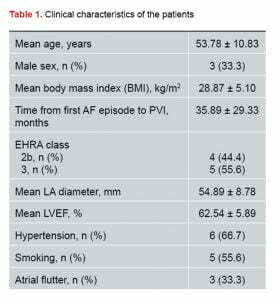 Heart Rhythm 2012; 9(2):172–8. Coppens M, Eikelboom JW, Hart RG, et al. The CHA2DS2-VASc score identifies those patients with atrial fibrillation and a CHADS2 score of 1 who are unlikely to benefit from oral anticoagulant therapy. Eur Heart J 2013; 34:170-176. Verma A., Kilicaslan F., Pisano E., et al. Response of atrial fibrillation to pulmonary vein antrum isolation is directly related to resumption and delay of pulmonary vein conduction. Circulation 2005; 112(5):627–35. Callans DJ., Gerstenfeld EP., Dixit S., et al. Efficacy of repeat pulmonary vein isolation procedures in patients with recurrent atrial fibrillation. J of Cardiovasc Electrophysiol 2004; 15(9):1050–5. Sawhney N., Anousheh R., Chen WC., Narayan S., Feld GK. Five-Year Outcomes After Segmental Pulmonary Vein Isolation for Paroxysmal Atrial Fibrillation. Am J Cardiol 2009; 104(3):366–72. Taghji P., El Haddad M., Phlips T., et al. Evaluation of a Strategy Aiming to Enclose the Pulmonary Veins With Contiguous and Optimized Radiofrequency Lesions in Paroxysmal Atrial Fibrillation: A Pilot Study. 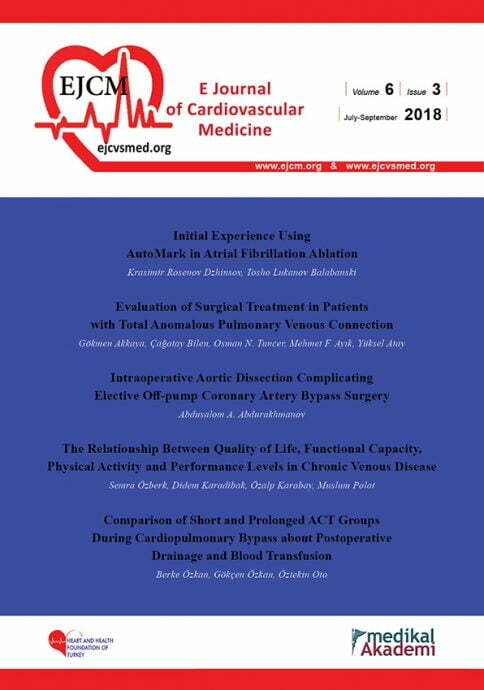 JACC: Clinical Electrophysiology 2018; 4(1):99–108. El Haddad M., Taghji P., Phlips T., et al. Determinants of Acute and Late Pulmonary Vein Reconnection in Contact Force-Guided Pulmonary Vein Isolation. Circ Arrhythm Electrophysiol 2017; 10(4):e004867. Neuzil P., Reddy VY., Kautzner J., et al. Electrical reconnection after pulmonary vein isolation is contingent on contact force during initial treatment: Results from the EFFICAS I study. Circ Arrhythm Electrophysiol 2013; 6(2):327–33. Bourier F., Hessling G., Ammar-Busch S., et al. Electromagnetic Contact-Force Sensing Electrophysiological Catheters: How Accurate Is the Technology? J Cardiovasc Electrophysiol 2016; 27(3):347–50. Guerra JM., Jorge E., Raga S., et al. Effects of open-irrigated radiofrequency ablation catheter design on lesion formation and complications: in vitro comparison of 6 different devices. J Cardiovasc Electrophysiol 2013; 24(10):1157–62. Duytschaever M., Taghji P., Tavernier R. Towards durable pulmonary vein isolation: We are closing the gap. Europace 2015; 17(8):1164–5. Wittkampf FHM., Nakagawa H. RF catheter ablation: Lessons on lesions. PACE 2006; 29(11):1285–97. Nath S., Haines DE. Biophysics and pathology of catheter energy delivery systems. Progress in Cardiovascular Diseases 1995; 37(4):185–204. Shah DC., Lambert H., Nakagawa H., Langenkamp A., Aeby N., Leo G. Area under the real-time contact force curve (force-time integral) predicts radiofrequency lesion size in an in vitro contractile model. J Cardiovasc Electrophysiol 2010; 21(9):1038–43. Yokoyama K., Nakagawa H., Shah DC., et al. Novel contact force sensor incorporated in irrigated radiofrequency ablation catheter predicts lesion size and incidence of steam pop and thrombus. Circ Arrhythm Electrophysiol 2008; 1(5):354–62. Ikeda A., Nakagawa H., Lambert H., et al. Relationship between catheter contact force and radiofrequency lesion size and incidence of steam pop in the beating canine heart: Electrogram amplitude, impedance, and electrode temperature are poor predictors of electrode-tissue contact force and lesion. Circ Arrhythm Electrophysiol 2014; 7(6):1174–80. Chinitz JS., Kapur S., Barbhaiya C., et al. Sites With Small Impedance Decrease During Catheter Ablation for Atrial Fibrillation Are Associated With Recovery of Pulmonary Vein Conduction. J Cardiovasc Electrophysiol 2016; 27(12):1390–8. Wilber DJ., Pappone C., Neuzil P., et al. Comparison of Antiarrhythmic Drug Therapy and Radiofrequency Catheter Ablation in Patients With Paroxysmal Atrial Fibrillation. JAMA 2010; 303(4):333. Melby SJ., Lee AM., Zierer A., et al. Atrial fibrillation propagates through gaps in ablation lines: Implications for ablative treatment of atrial fibrillation. Heart Rhythm 2008; 5(9):1296–301. Ranjan R., Kato R., Zviman MM., et al. Gaps in the ablation line as a potential cause of recovery from electrical isolation and their visualization using MRI. Circ Arrhythm Electrophysiol 2011; 4(3):279–86. Das M., Wynn GJ., Morgan M., et al. Recurrence of Atrial Tachyarrhythmia during the Second Month of the Blanking Period is Associated with More Extensive Pulmonary Vein Reconnection at Repeat Electrophysiology Study. Circ Arrhythm Electrophysiol 2015; 8(4):846–52. Kistler PM., Ho SY., Rajappan K., et al. Electrophysiologic and anatomic characterization of sites resistant to electrical isolation during circumferential pulmonary vein ablation for atrial fibrillation: A prospective study. J Cardiovasc Electrophysiol 2007; 18(12):1282–8. Park C Il., Lehrmann H., Keyl C., et al. Mechanisms of pulmonary vein reconnection after radiofrequency ablation of atrial fibrillation: The deterministic role of contact force and interlesion distance. J Cardiovasc Electrophysiol 2014; 25(7):701–8.